Stay refreshed and get a game in. 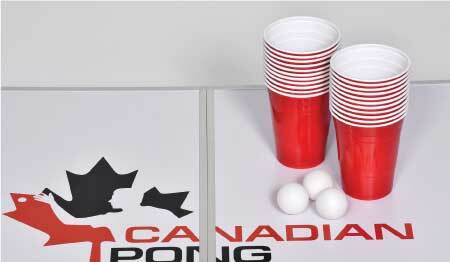 Bring a great activity to the pool or cottage party and you'll be an instant champ!!! - Not just for the drinking crowd, it's a great family game, play with juice or water. - Kids love it! Have plan to head South for a holiday? Take an inflatable table with you and bring the party to the resort! - It lays flat on the bottom of carry on luggage! 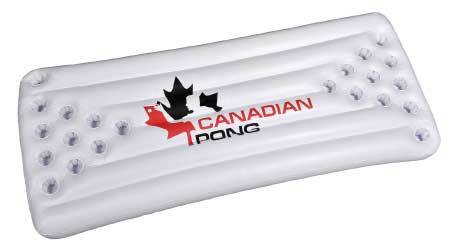 Inflatable 6’ x 3’ Beer Pong Raft. Perfect for pools or shallow lakes. When not in use for Pong, make use of that perfect 'cup holder' and work on that perfect tan, without worrying about your drink!!! Float around in perfect comfort and convenience. Get your table today, you'll use it all summer! 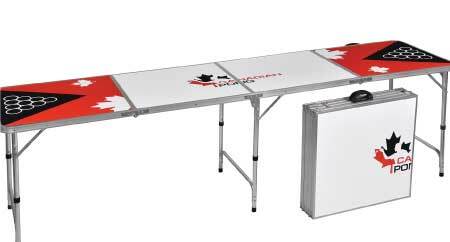 Canadian Pong tables are a quality product. The table is constructed with 21 pounds of aluminum and is top coated to make your playing surface water resistant and easy to clean. The table folds out to 8' x 2' x 28” high and folds down to 2' x 2' x 5” for easy transport. You can easily take it anywhere and it packs up small for tucking away when not in use. A handle is included for easy carrying. Pong is a great game! Show up to your next social event and set it up! - You may be surprised who steps up to sink a few cups. Great for: Parties, camping, up at the cottage, tailgating, family or neighborhood get togethers. 22 Solo Cups and 3 Balls. - You need these to play! Note: These are relatively pricey to ship (approx. $10 - $15 across Canada). However, it does save you the run around of having to go get some. © 2016 Canadian Pong. All Rights Reserved.